Scientists believe that the shape of the gases surrounding the black hole is like a 3D fountain, and is not doughnut shaped. Black holes are widely considered the most mysterious entities in the universe, and until now, experts have not succeeded to unravel the mysteries behind this perplexing space structure. But recent developments indicate that scientists are one step closer to understanding this powerful universal phenomenon. 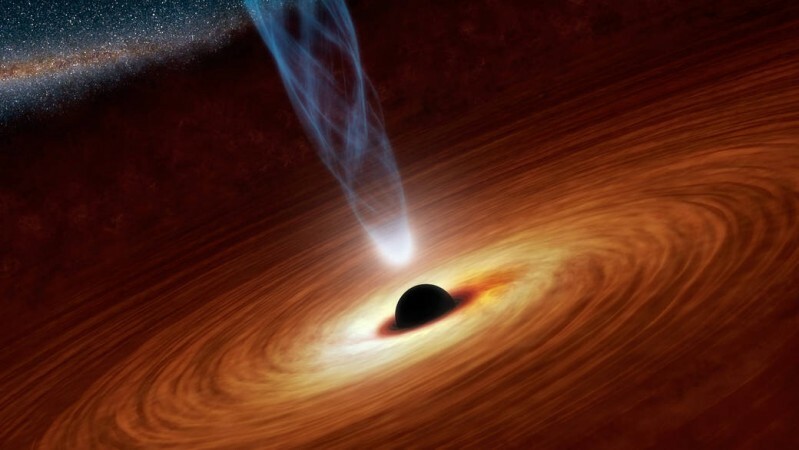 Experts believe that black holes are actually a part of spacetime with huge gravitational pull and nothing even light can escape from its powerful force. Previously, space scientists had speculated that black holes have the shape of a doughnut, but recent studies indicate that these space entities actually resemble 3D fountains. After studying a black hole 14 million light years away, scientists came to the conclusion that the structure and shape of black holes are more complex than previously thought. The new research conducted using Atacama Large Millimeter/submillimetre Array (ALMA) simulations suggests that the gas surrounding black holes spews from them in a 3D fountain, and it does not have any canny resemblance to a doughnut. "Previous theoretical models set prior assumptions of rigid doughnuts. Rather than starting from assumptions, our simulation started from the physical equations and showed for the first time that the gas circulation naturally forms a doughnut. Our simulation can also explain various observational features of the system. By investigating the motion and distribution of both the cold molecular gas and warm atomic gas with ALMA, we demonstrated the origin of the so-called 'doughnut' structure around active black holes," said Keiichi Wada, a scientist at the Kagoshima University, Express.co.uk reports. Keiichi Wada also added that this new finding regarding the shape of black holes will rewrite the astronomy books forever. A few days back, Stephen Hawking's final work 'Black Hole Entropy and Soft Hair' was released, and it too unveiled some dark secrets associated with black holes. As per the study report, the entropy of objects used to change once they fall inside the black hole. Even though the object trapped inside the black hole looks like it has disappeared, the information will linger around the edges of the black hole in 'soft hair'.